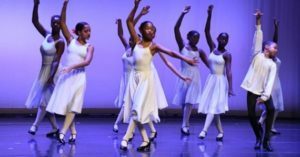 Inaugurated in the summer of 2005, Town Hall Education Arts Recreation Campus (THEARC) hosts The Washington School of Ballet’s Southeast Campus as well as two flagship community engagement programs, DanceDC and the EXCEL! Scholarship. THEARC is also home to ten other partner organizations, including Levine Music, ArtReach, Washington School for Girls, Trinity (DC) University, Children’s Health Project DC, Boys and Girls Club FBR Branch, Bridge Park and Covenant House, making it a widely-used community asset. Beyond the programs in the two original buildings, THEARC houses a 400-seat theater, art gallery, basketball courts and a community garden. In January 2018, THEARC will open a building that will host an expanded Children’s Health Project, The Community Meditation Center, Bishop T. Walker School for Boys and a 250-seat Black Box theater. For more information visit https://www.washingtonballet.org/twbthearc.